From alpine to ocean, the Comox Valley has numerous and varied hiking opportunities to suit every fitness level and scenic preference. A few of the many local trails are described below. See the links above for details on more Comox Valley hiking trails. The alpine trails in Strathcona Provincil Park close to Mount Washington meander through some of the most breathtaking natural terrain in BC. A thirty minute drive from downtown Courtenay, the Paradise Meadows trailhead is located near Mount Washington Alpine Resort accessable via the Mount Washington Parkway off the Island Inland Highway. The Paradise Meadows and Helen MacKenzie - Battleship Lakes Loops are both well graded class 2 trails with little or no elevation change. The Paradise Meadows Loop Trail is about 3km return to the parking lot, with a suggested hiking time of 30-60 minutes return. The Helen MacKenzie - Battleship Lakes Loop Trail is 6.8km return to the parking lot, with a suggested hiking time of 1.5 -3 hours return. The easiest overnight destination is at the designated camping area at the east end of Lake Helen MacKenzie. 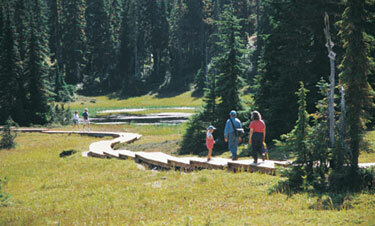 Located about 3.5km or 1-2 hours hiking time one way from the Paradise Meadows trailhead. Above Lake Helen MacKenzie hiking options are numerous, from larger loops, to overnight destination at designated camping areas of Kwai or Circlet Lakes. This trail system can also provide the gateway to more extensive hiking routes, such as the traverse to Buttle Lake or Comox Glacier. A paved walkway that runs along the Courtenay River and the estuary. The section along the estuary offer excellent opportunities for viewing many species of birds. A popular place for walkers, cyclists and rollerbladers, the Riverway's level grade will accommodate wheelchairs and infant stollers. The estuary area is an important wintering home for many waterfowl species, most notably Trumpeter Swans. Bird watching is better during tide changes. There are several trails, viewing structures and interpretive signs. Wildlife Viewing Highlights - Bald Eagles, Great Blue Herons and Mallards may be seen throughout the year. The estuary is especially good for birding during the winter and migratory periods. Shorebirds include Dunlin, Greater Yellowlegs, Lesser Yellowlegs, Short-billed Dowitcher, Long-billed Dowitcher and Western, Semipalmated, Least, Spotted, Solitary, Pectoral and Baird's Sandpipers. Waterfowl species include American Wigeon, Horned Grebe, Western Grebe, Greater Scaup, Harlequin Duck, Oldsquaw, Bufflehead, Marbled Murrelet, Surf Scoter, White-winged Scoter and Common Loon. A herring spawn in March attracts many gulls, Harbour Seals and Osprey. On the Comox Peninsula five minutes drive from Copes Islander Oceanfront B&B, Seal Bay Park offers an varied network of wooded trails. More details: Seal Bay Regional Nature Park .